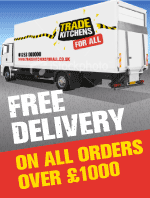 This page (together with Our Cancellations & Returns Policy and Privacy & Cookies Policy) tells you information about Us and the terms and conditions on which We sell any of the products listed on Our website (Products), www.tradekitchensforall.co.uk (Our Site) and on which You may use Our Site (Terms). These Terms will apply to any contract for the sale of Products by Us to you (Contract). Please read these Terms carefully and make sure that you understand them before ordering any Products from Our Site. Your use of Our Site signifies your acceptance of the Terms. We reserve the right at Our absolute discretion to amend the Terms, the amended version of which will appear on Our Site. Your continued use of Our Site signifies your acceptance to the Terms from time to time. Please check these Terms to ensure that you understand the terms which will apply at the time that you order the Products. We will not file a copy of the Contract between you and Us and you should therefore print a copy of these Terms or save them to your computer for future reference. These Terms, Our Cancellations & Returns Policy, Privacy & Cookies Policy and any contract between Us and you incorporating them are only in the English language. We are Trade Kitchens For All, a trading name of David John Interiors Limited, a company registered in England and Wales under company number 6212182 and with Our registered office at Long Meadow Farm, Church Lane, Clifton, Preston, Lancashire, PR4 0ZE (We, Us, Our). Our trading address is Long Meadow Farm, Church Lane, Clifton, Preston, PR4 0ZE. Our VAT number is 703401489. For details on how to contact Us, please see Our Contact Us page. The images of the Products on Our Site are displayed for illustrative purposes only. Although We have made every effort to display the colours accurately, We cannot guarantee that your computer's display of the colours accurately reflect the colour of the Products. Your Products may vary slightly from those images and those Products made of natural materials such as wood and stone will contain natural variations. Although We have made every effort to be as accurate as possible Products may not exactly match all sizes, weights, capacities, dimensions and measurements indicated on Our site and packaging of the Products may vary from that shown on images on Our Site. All Products shown on Our site are subject to availability. We will inform you by e-mail if the Product you have ordered is not available. We only use your personal information in accordance with the terms set out in Our Privacy & Cookies Policy. Please take the time to read these, as they include important terms which apply to you. As a consumer, you have certain legal rights in relation to Products that are faulty or not as described. Advice about your legal rights is available from your local Citizens' Advice Bureau or Trading Standards office, nothing in these Terms will affect these legal rights. If you are not a consumer, you warrant that you have authority to bind any business on whose behalf you use Our Site to purchase Products. After you place an order, you will receive an e-mail from Us acknowledging that We have received your order. However, please note that this does not mean that your order has been accepted. Our acceptance of your order will take place as described in the next paragraph below. We will confirm Our acceptance of your order to you by sending you an e-mail that confirms the details of the order, the amount paid, any right you have to cancel your order (as described in Our Cancellations & Returns Policy) and estimated delivery time (Order Confirmation). The Contract will only be formed when We send you the Order Confirmation. If We are unable to supply you with a Product, for example because that Product is not in stock or no longer available or because of an error in the price on Our Site, We will inform you of this by e-mail and We will inform you of suggested alternatives where appropriate or We will not process your order if there are no suitable alternatives. If you have already paid for the Products, We will refund you the relevant amount as soon as possible. Payment for the Products and all applicable delivery charges are made in advance and does not mean that a binding contract has been formed. Prices for our Products may change from time to time, but changes will not affect any order which we have confirmed with an Order Confirmation. The price of a Product does not include delivery charges. Our delivery charges are as quoted on Our Site from time to time. Our Site contains a large number of Products. It is always possible that, despite Our best efforts, some of the Products on Our Site may be incorrectly priced. If We discover an error in the price of the Products you have ordered We will inform you in writing to inform you of this error and We will give you the option of continuing to purchase the Product at the correct price or cancelling your order. We will not process your order until We have your instructions. If We are unable to contact you using the contact details you provided during the order process, We will treat the order as cancelled and notify you in writing. Please note that if the pricing error is obvious and unmistakeable and could have reasonably been recognised by you as a mispricing, We do not have to provide the Products to you at the incorrect (lower) price. We will do Our best to deliver your order by the estimated delivery date set out in the Order Confirmation. Time is not of the essence in delivery and We will arrange to contact you directly or through Our courier to confirm the delivery date when it is known. 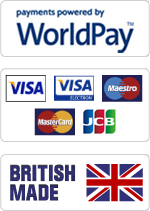 You own the Products once we have received payment in full, including all applicable delivery charges. We may deliver the Products in instalments if all of the Products are not available at the same time for delivery. Delivery will be completed when We deliver the Products to the address you gave Us. If no one is available at your address to take delivery, We will leave you a note informing you that the Products have not been successfully delivered and information enabling you to arrange for redelivery. Please note that in these circumstances, additional charges may be incurred. The Products will be your responsibility from the completion of delivery. Upon receipt of the Products you must inspect the Products and sign for them as 'undamaged' or 'damaged' accordingly. Where the Products to be delivered are large/bulky items, it will be your responsibility to ensure that arrangements are made to move the Products from the kerbside to your property and to assess if they will fit through doors or other accessways. We do make deliveries outside of the UK but unfortunately, We do not deliver to addresses outside of the European Union (EU). You may place an order for Products from outside the EU, but this order must be for delivery to an address in the EU. While additional delivery charges will be incurred for deliveries to addresses outside the UK, we have no knowledge of, and no responsibility for, the laws in your country of residence. Please contact us via the Contact Us page for a no obligation quotation for international delivery charges. By purchasing the Products, you warrant that you are legally obliged to import them into your country of residence and that you will be responsible for the payment of any import duties or taxes in doing so. Some of the Products We sell to you come with a manufacturer's guarantee. For details of the applicable terms and conditions of any manufacturer's guarantee, please refer to the manufacturer's guarantee provided with the Products. To make use of the guarantee you may be required to deal directly with the manufacturer. If you are a consumer, a manufacturer's guarantee is provided in addition to your legal rights in relation to Products that are faulty or not as described. e) any specification provided by you. If you are a consumer, this warranty is in addition to your legal rights in relation to Products that are faulty or not as described or your other statutory rights as set out in Our Cancellations & Returns Policy. Subject to the provisions of this clause as set out above, Our total liability to you in respect of all other losses arising under or in connection with the Contract, whether in contract, tort (including negligence), breach of statutory duty, or otherwise, shall in no circumstances exceed the price of the Products. If We fail to comply with these Terms, We are responsible for loss or damage you suffer that is a direct foreseeable result of our breach of these Terms or Our negligence, but We are not responsible for any loss or damage that is not direct, is purely economic in nature or is not foreseeable. If there are special circumstances applicable to your order you should specify them in writing with your order and We will consider their effect in deciding whether and on what terms to accept your order. If you wish to contact Us in writing, or if any clause in these Terms requires you to give Us notice in writing, you can send this to Us by e-mail at sales@tradekitchensforall.co.uk or by pre-paid post to Trade Kitchens For All at Long Meadow Farm, Church Lane, Clifton, Preston, Lancashire, PR4 0ZE. We will confirm receipt of this by contacting you in writing, normally by e-mail. For information on your cancellation and returns rights, please see Our Cancellation & Returns Policy. If you are a business, please note that any notice given by you to Us, or by Us to you, will be deemed received and properly served immediately when posted on Our Site, 24 hours after an e-mail is sent, or three (3) days after the date of posting of any letter. In proving the service of any notice, it will be sufficient to prove, in the case of a letter, that such letter was properly addressed, stamped and placed in the post and, in the case of an e-mail, that such e-mail was sent to the specified e-mail address of the addressee. The content of Our Site and any material that We send to you or that you download from Our Site are Our copyright. Our material also includes both word and logo trade marks. You are permitted to download and print material from Our Site provided that this is for your personal use only. You may not reproduce or use the material for commercial use. You are not permitted to make copies of, distribute or alter these materials in any way or otherwise use any material on Our Site. These Terms are governed by English law. This means a Contract for the purchase of Products through our site and any dispute or claim arising out of or in connection with it will be governed by English law. You and We both agree to that the courts of England and Wales will have exclusive jurisdiction.